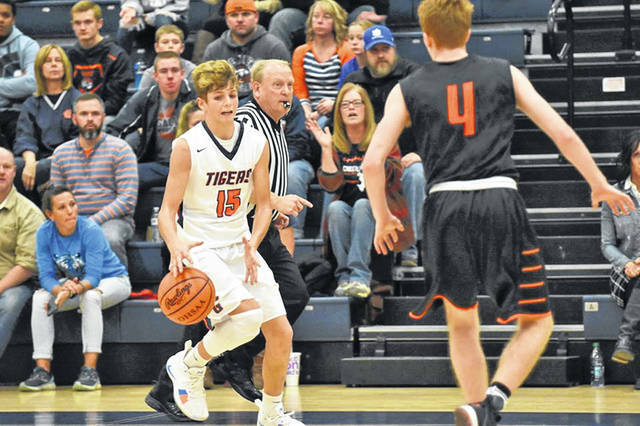 GALION — After opening their season with a win at Bucyrus, the Galion Tigers boys basketball team played in their home opener on Wednesday, December 5 against another Northern-10 Athletic Conference opponent in the likes of the Upper Sandusky Rams. In a contest that began very lopsided, the hometown Tigers battled back but would fall to the Rams on Winter Sports Senior Night; 71-56. With the loss, Galion falls to 1-1 on the season as Upper now sits at a perfect, 3-0. It took almost a minute and a half into the opening quarter before either team scored but the Rams would sink the first bucket and would proceed to be off and running. With 4:43 remaining in the first frame, Galion head coach Matt Valentine signaled for a timeout as his team was down by eight at 10-2. After the first four minutes of play, Valentine saw his team already sitting with five committed turnovers. Once the buzzer sounded, the home team found themselves in quite the deficit, trailing Upper; 22-7. The run and gun offense would continue for the Rams in the second but, at that point, the quick pace also sat in for the Tigers. Both squads would jostle back and forth in the second quarter and Galion would go on to outscore the high octane offense of Upper to the tune of 20-16 in the frame to bring the score to 38-27 in favor of the guests at intermission. To begin the second half, the story stayed relatively the same; fast-paced offense and rather relaxed defense as the Rams posted 21 points in the eight-minute frame while the Tigers tacked 18 points onto their score. Heading into the final quarter of regulation, Galion was hanging tough with a team that entered the contest having scored 83 points in each of their first two games; 59-45. 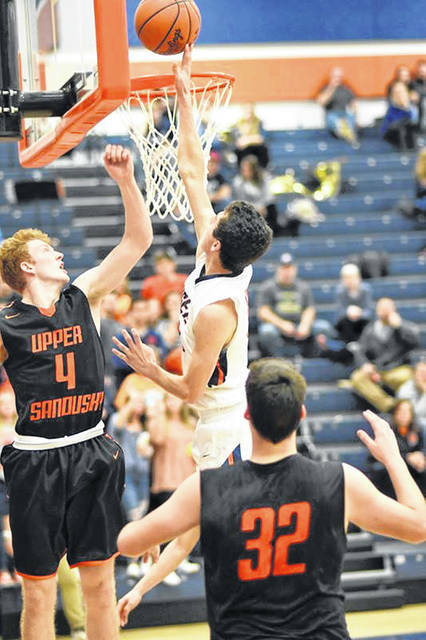 In that fourth quarter, the offenses, due to either exhaustion or substitutions, seemed to slow a bit as Upper managed just 12 points while holding the Galion squad to 11 en route to the 71-56 win for the black and orange. Gage Lackey would once again lead the way for the Tigers, posting his second double-double in as many games. 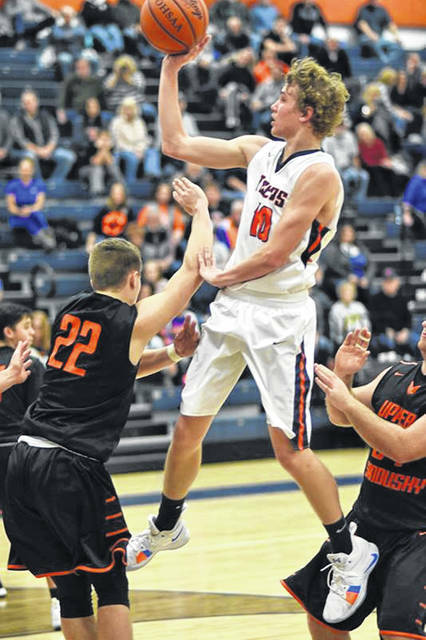 The senior scored 14 points for Galion while pulling in 15 rebounds, five of which were on the offensive end. Lackey also dished out three assists and finished the game with a block. Fellow senior Jack McElligott also reached double figures in scoring against Upper, chipping in 11 points to go along with 10 rebounds for his first double-double of the young season. McElligott rounded out his stat line with five assists, three blocks and two steals. Joining Lackey and McElligott in double figures on the night was freshman Hanif Donaldson. Donaldson had 10 points as well as four rebounds and an assist for the Tigers in the loss. As a team, Galion shot 26/56 (46%) from the field, including 22/42 (52%) from the interior and just 4/14 (29%) from the perimeter. On the evening, the Tigers did not make a single trip to the free-throw line. The home team grabbed a total of 39 rebounds (12O, 27D) against Upper while dishing out 15 assists, blocking eight shots and recording three steals, all while committing 20 turnovers against the pesky, Rams defense. Other statistics on the evening for Galion were: Isaiah Alsip- fouled out, 9 points, 1 rebound, 2 assists; Carter Keinath- 1 rebound, 1 assist; Stephen Thompson- 1 rebound; Tristan Williams- fouled out, 4 points, 3 rebounds, 3 assists, 3 blocks, 1 steal and Carter Valentine- 8 points, 1 rebound, 1 block. The Tigers will be back in action on Friday, December 7 when they head to Marion to kick-off their Mid-Ohio Athletic Conference schedule against the hosting Pleasant Spartans. After a few days off, Galion will make another road trip on Thursday, December 13 when they head to Caledonia to tip-off against the River Valley Vikings. The next home game for the blue and orange is set to take place on Saturday, December 15 when they play host to the Harding Presidents.